The Alphen Boutique Hotel in Cape Town is a beautiful historical property that offers outstanding facilities and exceptional service. It is situated on a scenic estate in the Constantia Valley. The Alphen Boutique Hotel is a historic country hotel that is built around and 18th century Manor house in the leafy suburb of Constantia. The Hotel has a spectacular setting amidst the dappled shade of ancient oaks and it has beautiful gardens, which create a tranquil and inviting retreat around this historic hotel. You will be accommodated in beautifully designed rooms that offer you all the creature comforts. 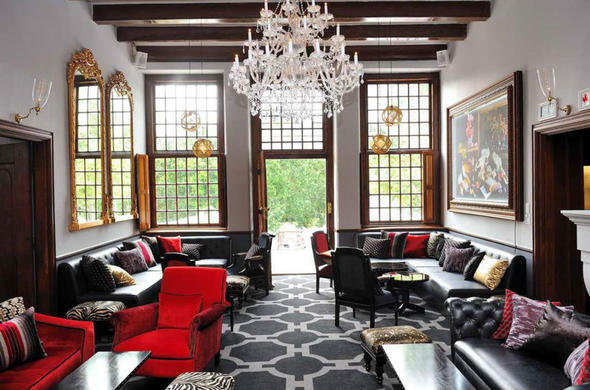 The Alphen Boutique Hotel has two restaurants and a bar. Enjoy a tasty meal at La Belle Cafe & Bakery, which offers casual dining on a lovely terrace looking onto the garden. Contemporary Italian cuisine can be enjoyed at Blanko restaurant which is situated in the 300-year old Manor House. Nearby attractions to Alphen Hotel include the Constantia Wine Route, Kirstenbosch National Botanical Gardens, world class golf courses, the Cape Peninsula National Park and many vibrant shopping centres in Cape Town. The hotel has a small conference venue as well as two boardrooms that are the perfect place for you to conduct a business meeting. The hotel staff will gladly help you organise conferences or functions at your request.